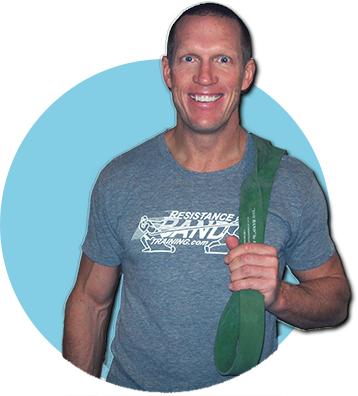 Over the years I have come across 10 advanced band exercises for the arms I rarely see trainers or fitness enthusiasts attempting. Some of these are more advanced band exercises and need to be progressed up to. Here are a few rules to keep in mind when progressing into more advanced band exercises. If the advanced exercise requires going faster, make sure you have mastered the slow version first. Also, when trying to go faster, focus on the concentric phase first and keep the eccentric phase slow and controlled. If the advanced exercise requires taking a step or a hop while performing the upper body movement, make sure you are not dragging the foot or feet as it moves which will result in the band getting shredded. Also, try to release the band back to the starting point of the exercise first before moving your feet back to the starting point. Do not use an orange micro band or yellow super micro band to do any advanced step exercises. These two bands are only 7.5 millimeters thick and will not hold up well to advanced band training exercises. Also, due to their low resistance, they are often overstretched during advanced type exercises. Make sure full range of motion is being achieved with advanced band exercises. Very often as the speed or exercise difficulty increases, people do not complete a full range of motion due to balance or control issues. With any advanced band exercise that requires a stepping action, the coordination of two movements happening simultaneously must be smooth and controlled. If this is not the case, very often the working muscles may not respond well to the exercise.